Although recently a lot of my kitchen creation efforts have been diverted towards some other projects, including copious amounts of jams and chutneys (I am planning VERY FAR ahead for christmas this year), I have managed to get in a little creative caking of late. The latest project was a very interesting, and for the marine geek side of me, a very exciting one! 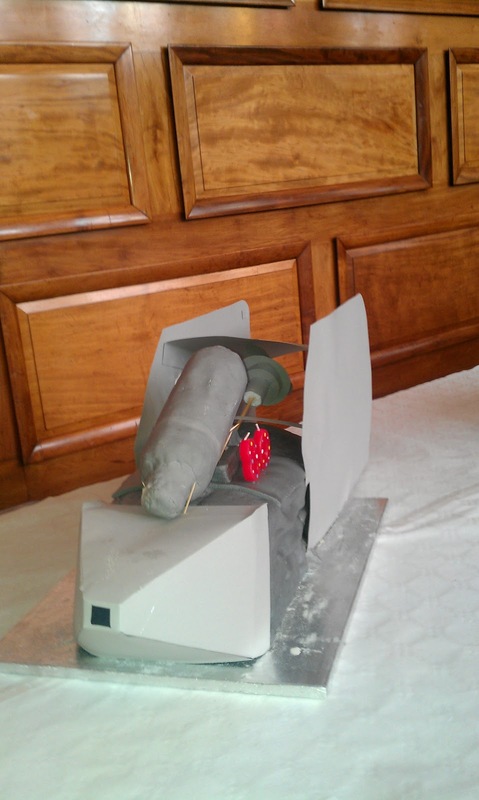 I was asked to create a cake in the shape of a Continuous Plankton Recorder (or CPR) a piece of machinery, used by the Sir Alister Hardy Foundation for Ocean Science (SAHFOS) to record the different plankton found in water around the world, when towed behind ships. Yes I realise I am very uncool that I got very excited about this, but oh well, I shall live on! This cake was to celebrate the 80th year that the CPR has been used (which explains the candles!). There are a couple of things I think I would have done differently next time. I would have preferred to have matched the fondant colour to the card better, unfortunately this didn't come off as well as I had hoped. I think next time I will also need to remember to trim the cake better before adding the fondant so that it lies against a flatter surface and avoids that bumpy look. 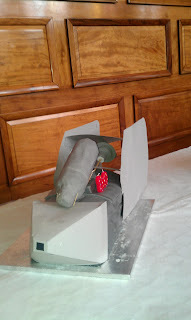 There were a few moments where I had cause for concern with, not so much the cake itself, as the attachments added to it. The card at the back was somewhat flimsy, and upon set up, I found that it was not standing up straight. Luckily some bits of card from a handy thorntons' chocolate box, and a little sellotape to provide stability, and we were good to go, with the card now holding upright happily. 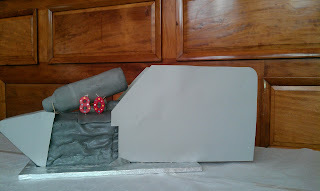 I also had a brief movie moment, when the tube-shaped part sitting at the front, overbalanced and rolled sideways off the cake. I watched from a few feet away from the table, as it made it's inexorable way towards the edge, and inevitably the floor .... I took a hollywood stunt-woman style dive accross the table, and with the tips of my fingers, thank goodness, just managed to catch it as it went for a diving lesson. Once, all of these little incidents had been overcome, all in all the cake went down very well! I enjoyed making this creation and I am looking forward to a new challenge. Now all I need is some inspiration for a new theme with which to go! ..... hmmm so many possibilities, only one cake to be made at a time! Happily, at the end I also had a couple too many sponges left over, which was fantastic as I decided to experiment with peanut butter in buttercream icing. I chose to make peanut butter and chocolate icing, and oh wow has it gone down well! If you like reese's peanut butter cups, this is like melting them down and smothering cake with them! What could possibly beat that?! Its really simple if you have an electric mixer or blender. Just pop all the ingredients in the bowl and blend or whisk until smooth and well mixed. If the mixture is very runny, add extra icing sugar until a thicker consistency, that spreads easily but doesn't run is achieved. Conversely if the mixture is too thick to spread you can add water (a very small amount at time!) to thin it out a little. If you don't have an electric mixer, I suggest whisking the butter, peanut butter, vanilla and water together until creamy. Then add the remaining ingredients and whisk until they are all combined. Follow the same instructions above to ensure a good consistency. Then, if you can stop yourself from eating the icing on its own! Stick it on a cake of your choice. I had spare vanilla sponge, which has worked a treat, but I suspect a chocolate, or even peanut butter related sponge flavour, would be superb also. Part 2 ... It's finished!